But another masterpiece Borovikovsky – a portrait of Skobeeva. The daughter of the Kronstadt sailor, she was still a girl in the house of DP Troshchinsky, who brought her up as a noblewoman and made her mistress. Leaving for a revision in Siberia, Troshchinsky sent a young woman to his Smolensk estate, away from the temptations of secular life. It is unlikely that he could assume that there his lover would get acquainted with the local landowner Skobeev and marry him, thereby acquiring the rights of the nobility. Working on this portrait. Borovikovsky repeated some of the techniques found earlier. Pose of the woman. 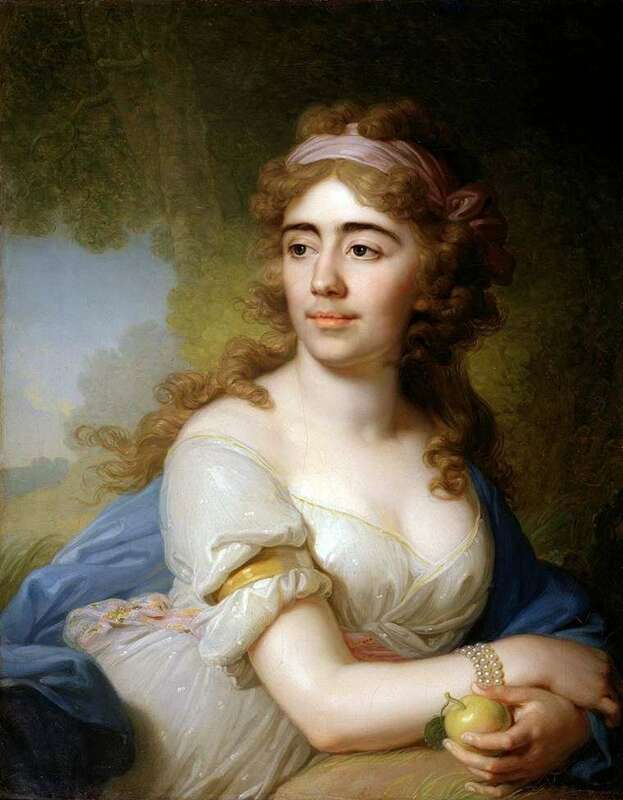 her white dress, a pearl bracelet, an apple in her hand – all this is as it were “copied” from the portrait of Arsenyeva. However, such an identity remains almost invisible: images are so different. Instead of a cheerful, frivolous Arsenyev, we have before us an energetic woman with large features, thick black eyebrows, a strict and resolute gaze. Her inner composure, her uncommon character, clear, purposeful will are felt. Description and meaning of the painting Portrait of Skobeeva by Vladimir Borovikovsky.